The Egerton is a town house hotel, meaning it was once a private residence dating from 1843 (actually it was two which were subsequently merged) and is still a privately owned hotel today. It began its current life providing accommodation within central London in September 1990. A hotel that provides traditional old style service with the elegance and hospitality of a bygone age. Furnished throughout with fine fabrics and antique Italian furnishings. Works of art include items from artists such as Picasso, Matisse, and Toulouse-Lautrec. Each bedroom is individually decorated with a range of styles from flamboyant to more peaceful tones. They all have antique furniture and original works of art, are air-conditioned and have their own period style marble bathroom (bath, power shower, Molton Brown Toiletries, hairdryer, robes, slippers, TV). In-room amenities include two-line direct dial telephone dataport and voicemail, complimentary high speed internet access, hairdryer, speciality tea/coffee facilities, safes radio, DVD/CD player, interactive flat screen television, Ipod docking station, video ipod and well stocked minibar. All rooms have hand-stitched mattresses, down pillows and duvets or 200-thread Egyptian cotton sheets. Most bedroom shave a view over the hotels gardens and some also have a four poster bed. Choice of robes and slippers. Room types are Classic Double, Deluxe Queen, Deluxe Kings and Studio Suite. The last named suites are located on the hotels top floors giving great views over the garden. The Egerton House Hotel offers 24 hour room service and evening turndown service. Twice daily housekeeping. Fax machines and printers can be requested for room use. DVD player on request. The Bar: Stylish and discreet. Serves a full range of drinks from cocktails to ice cold Martini along with a snack menu. Drawing Room: Elegant room where guests can relax. Traditional Tea is served here and guests can also choose to dine (lunch, dinner) here as there is no formal restaurant. The hotel will try and accommodate requests even for dishes not on the menu. Afternoon Tea: Choose from an extensive tea menu and perhaps a glass of chilled Champagne, and tuck into an assortment of delicate finger sandwiches, freshly baked scones with home made preserves and an array of cakes and pastries. Vegan Afternoon tea: Homemade vegan cakes including iced chocolate brownie, vanilla and coconut sponge, lemon drizzle cake, fruit and custard tartlet and vanilla cupcake. Freshly cut sandwiches including grilled vegetables on granary baguette, guacamole and rocket on white bread, chickpea-coronation on granary bread, cucumber on brown bread and tomato and olive tapenade on sun-dried tomato bread. Freshly home baked vegan plain and fruit scones served with a selection of preserves. The Egerton House Hotel has a single meeting room with room, for 12 delegates if you should have need of these facilities. Secretarial services also offered. Mobile phones and laptops can be hired from the hotel. There is a concierge available 24 hours. Additionally onsite is a Butler and valet service. Express check-out option. WiFi accessible in all parts of the hotel. There is a dedicated area with business facilities and computer. The hotel has a special arrangement with the nearby LA Fitness club for day passes which gives free use of a range of facilities including the indoor swimming pool. Spa treatments and massages can also be arranged in-room. Nearest: Tube Station: South Kensington 0.4 miles (0.6 km), Railway Station: London Victoria 1 miles (1.6 km), Motorway: M4 Junction 1 4.8 miles (7.7 km). The Egerton House Hotel is located in a relatively quite side street off of the very busy Brompton Road. This area is classed as Knightsbridge even though the postcode of SW3 is normally classified as Chelsea. This is a central London location within an upmarket part of the city. Brompton Road itself is home to may large stores such as Harrods and Harvey Nichols as well as smaller boutiques along with bars and cafes. Just to the East of the hotel is Sloane Street which has a high reputation for its fashion shops while half a mile to the south is the ever popular Kings Road. This road has for decades been seen a trend setter in trendy fashion but also has a lot more to offer by way of bars and restaurants. Its a major venue for nightlife. Less than half a mile to the north of the hotel is Hyde Park and Kensington Gardens. A large open area with much to see and do including the Diana memorial Fountain and Kensington palace itself. The parks border the start of Kensington High Street which has a good cross section of shops and cafes to ensure there's something for everyone. The main nightlife area, West End and theatreland are to be found a mile and a half to the north east and centred around Piccadilly circus. Nearest places of interest include Victoria and Albert Museum (0.17 miles), Science Museum (0.28 miles), Natural History Museum (0.39 miles), Albert Memorial (0.47 miles) and Royal Albert Hall (0.54 miles). Major attractions are Buckingham Palace (1.15 miles) and the London Eye (2.14 miles). Private parking is available in close proximity to the hotel and costs £35 per day. Milestone Hotel and Apartments: is 0.9 miles (1.4 km) away, has a guest satisfaction score of 100% and rates start from about £319. 41 Hotel: is 1.0 miles (1.7 km) from here, earns a customer rating of 100% and base rates begin at about £366. Rubens At The Palace Hotel: 1.0 miles (1.7 km), rated at 90% and with rates from around £188. Chesterfield Mayfair Hotel: 1.1 miles (1.8 km), rated at 98% and with rates from around £209. Compared to other London hotels: This hotel has been rated 99% by past guests. The London average is 80% and the average for 5 star hotels is 89%. Therefore this hotel is well above average for its sector (star rating) and for London as a whole. Red Carnation Hotels across the chain average 95% so this hotel is one of the better rated Red Carnation hotels. Milesfaster ranking: 11th from 866 London hotels, 3rd of 6 Red Carnation Hotels, and 8th of 131 five star rated hotels. For somewhere with lower starting rates try the Grange City Hotel. 0.1 miles from here (0.1 km), gaining a satisfaction rating of 82% from its past guests and the hotels starting rates begin at about £111. Prefer a tried and tested hotel close by judged by its guests ratings? We think the 5 Star 41 Hotel stands out in that regard being 3.0 miles (4.8 km) from the Egerton House Hotel. The 41 Hotel has a perfect unblemished customer rating 100%, a truly stunning achievement. 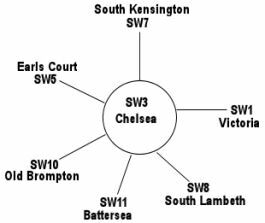 The fifty closest hotels from here (17-19 Egerton Terrace, SW3 postcode) that we have data for cover a 0.7 miles (1.2 km) radius. The 50 are made up of 23 five star hotels (average rating 90%), 23 four star hotels (average rating 83%) and 4 three star hotels (average rating 68%). Coming out as the top rated hotel are Egerton House Hotel (this hotel) (5 star) and also the Lanesborough Hotel London (5 star) (both joint top with 99%). Base Rates: Using base rates we analyse average starting rates for the area. Useful as a guide but note they do not include special offers or short term deals. Of the 50 closest hotels analysed we have base rate data for 49 of them. The average rate for all the 50 nearest hotels is £221 per night. Starting from £49 at Eden Plaza Hotel (3 Star, 75%) and the Montana Hotel (3 Star, 80%) up to £752 at Bulgari Hotel London (5 Star, 91%). Averages by star rating: Five Star average: £306, Four Star average: £153 and Three Star average: £73. We use a proprietary algorithm to rank hotels based on user reviews but adjusting for contributing factors. We rank Egerton House Hotel 1st (joint) of 50 nearby hotels and 1st (joint) for the 23 five star hotels in the area. In terms of lowest starting rates this hotel is 41st of 49 (14th of 22 five star hotels.). Analysing both the base rates and overall rating for the hotel we rank it 1st of 45 for sheer value for money. Therefore this is a definite recommended hotel since it is also the top guest rating pick. A tremendous guest rating score resulted in a great value for money ranking even though the hotels base rates are above average for 5 star hotels.